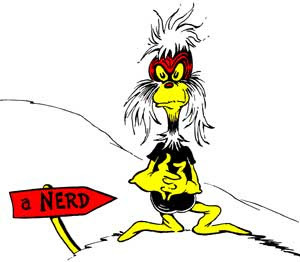 Did you know the first documented use of the word Nerd was in the 1950 Dr. Seuss story, If I Ran the Zoo, in which a boy named Gerald McGrew made a large number of delightfully extravagant claims as to what he would do, if he were in charge at the zoo. Among these was that he would bring a creature known as a Nerd from the land of Ka-Troo. The accompanying illustration showed a grumpy character with unruly hair and sideburns, wearing a black T-shirt. A fitting image, these days, for a nerd.